Olive Krick “Lolly”, age 97, peacefully passed away surrounded by her loving family on Friday, May 3, 2018. Olive was preceded in death by her husband of 70 years and “love of a lifetime”, Paul G. Krick. Olive was born in Throckmorton, Texas to Della Mae Puryear Edwards and James Hollingsworth Edwards. Olive was a twin until the age of two when her sister passed away; she had three brothers and 2 other sisters, of which she was the last surviving child. Olive had a fearless attitude towards life, living it to the fullest. She hit the jackpot when she met Paul and impulsively got on a bus at age 17 to marry him; that decision led to 70 full years of marriage, 2 children, 3 grandchildren and 5 great-grandchildren. She wasn’t just lucky in love; she had a way with the slot machines, “42”, bingo, bowling, and took top place in talent shows and tournaments alike. Olive always carried herself with such poise and grace, a true lady, which made her surprising off-color humor that much more delightful. 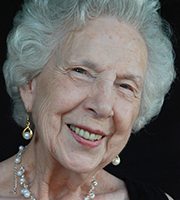 Olive filled every room with joy and song; she will always be remembered for her deep love of family, and years of service at St. Stephen’s United Methodist Church, with the Methodist Hospital Auxiliary Thrift Shop both in Houston, and the Hill Country Senior Citizens Center of Dripping Springs. Olive is survived by her son Paul G. Krick Jr. of Waco, Texas; daughter Betty Phillips and husband Tom of Dripping Springs, Texas; three granddaughters, Jennifer Henderson, husband Chris and great-grandson Reid of Georgetown, Texas; Allison Connorton, husband Matt and great-grandchildren Garrett and Audrey of Oakland, California; Catherine Humphrey, husband Blayke and great-grandchildren Elliot and Amelia of Norman, Oklahoma. Olive was laid to rest next to her loving husband Paul in the Fitzhugh Baptist Cemetery in Dripping Springs on May 7, 2018. Honoring Olive as pallbearers were Tom Phillips, Jr., Dubby Bourland, Chris Henderson, Matt Connorton, Blayke Humphrey, Daniel Glover, and Billy Papalexandris. Condolences may be made at www.cookwaldenforestoaks.com. Arrangements under the care of Cook-Walden/Forest Oaks Funeral Home, 6300 W. William Cannon Dr., Austin, Texas, 78749.